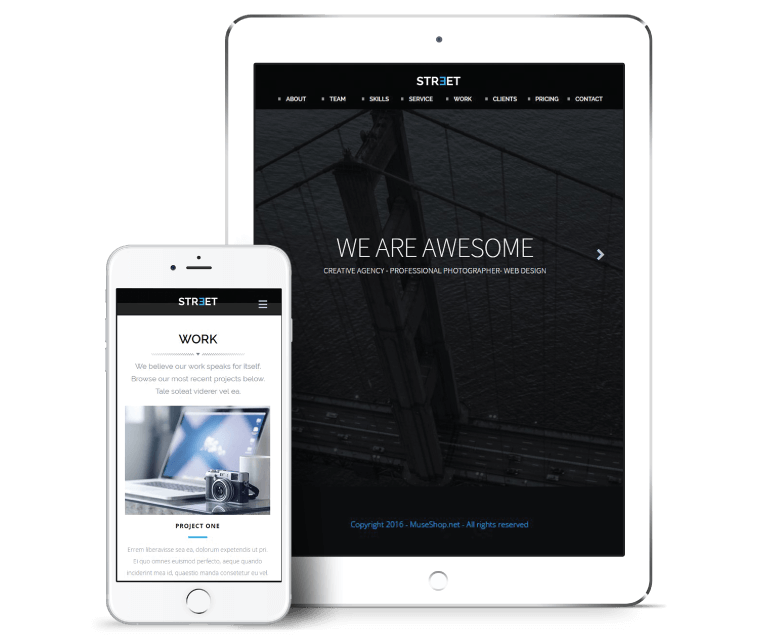 Street is a professional Adobe Muse multipurpose theme with Clean and Modern design. It is very easy to use and brings a lot of amazing custom features like CSS3 effects and Animations widget, Edge Animate stripe overlays, Animation skill bar widget, Full screen video background widget, Easy one-step color change, Amazing Three Homepages and all the latest Muse features. Street perfectly combines dark and bright styles to bring amazing visual appearance to your online business. With Street you get 3 individually designed Home page styles: Full Screen Slide Show, Hero Image, Video Background, Awesome Pricing Page, Team Member Template, Single Service Template, SEO compatible, Beautiful Custom Rollover Effects and Animations(CSS3, Paragraph Styles Defined, Link Styles Defined, Graphic Styles Defined and Superfast Loading and much more. Desktop, Tablet and Mobile Version Included. This theme perfectly combines dark and bright styles to bring amazing visual appearance to your online business.